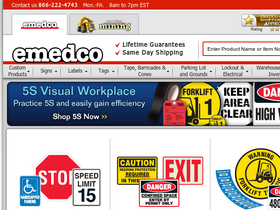 Emedco, online at Emedco.com, is the leading manufacturer and distributor of workplace signs and identification. Emedco offers a wide selection of signs and custom products designed to increase safety and security. Emedco carries safety signs, danger signs, OSHA signs, ANSI signs, custom traffic and parking signs, exit signs, custom labels, shipping labels, caution tape, tapes, cones, barricades, traffic signs, warehouse safety products, janitorial and sanitation products, and much more. Whatever your sign need, Emedco is here to help. But before you shop, get all the latest emedco.com discounts, Emedco promotions, and Emedco coupon codes found here at RetailSteal.com. Emedco ships within the U.S., Canada, U.S. possessions and territories, and APO/FPO addresses. Emedco offers shipping via UPS ground and offers air freight. See site for more information. Save 20% on your purchase from Emedco. Save on custom signs, labels, security products, and more. Use coupon code to save. Get free ground shipping on your entire order from Emedco. Click here to activate offer and save. Save 20% on any order at Emedco. Save on safety signs, custom signs, labels, parking signs, and more. Click link to activate offer and enjoy savings. Save 15% on your purchase from Emedco. Click link to shop and use promo code. Shop for a wide variety of safety labels, starting from $5 at Emedco.com. Click here to shop selection. Go to Emedco for property and security signs, starting as low as $10. Click here to shop selection. Shop for safety and traffic cones, starting from $48 at Emedco.com. Click here to shop.